Legal Aid at Work is a nonprofit legal services organization that has been assisting low-income, working families for more than 100 years. We use four main strategies to enforce and strengthen workers’ rights: free clinics and help lines, free legal info, litigation, and policy advocacy. 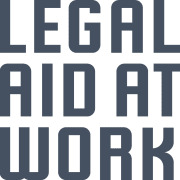 Through counseling, advocacy, education and impact litigation, Legal Aid at Work's efforts help gain equal access to jobs and employment opportunity and work to eliminate barriers, while enforcing and expanding legal protections of workers' health, security, and well-being. Would you recommend Legal Aid at Work?